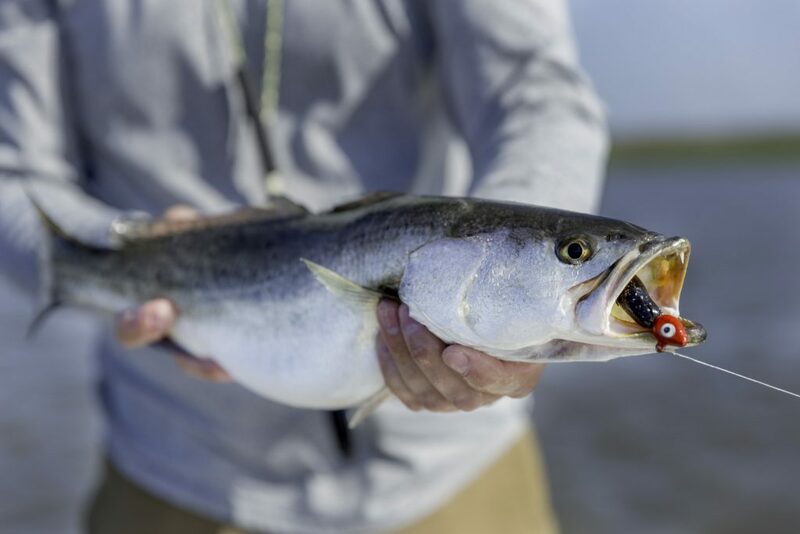 Speckled Sea Trout Fishing means explosive bites and aggressive fighting! The way Specks fight and there beautiful colors make them a spectacular game fish! Big yellow mouths lined with teeth and fangs make them an ultimate ambush predator. Small trout feed primarily on shrimp and small bait fish. The smaller fish will be males and fish over 20 inches will almost always be female. On my boat, big female sows are ALWAYS RELEASED as they can drop hundreds of thousands more eggs than younger smaller females. If I decided to keep a few for the fry pan then I prefer them 15-18′ long. Anything larger goes back to swim another day. 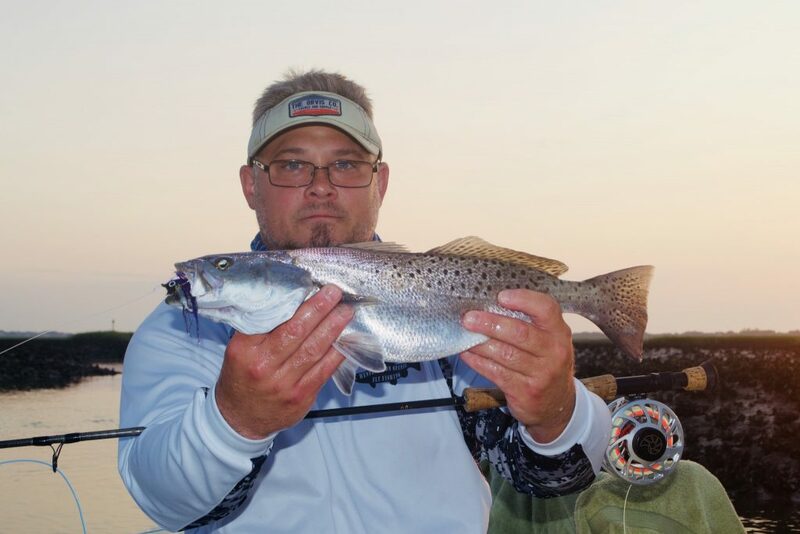 Spring and late fall is the best Speckled Sea Trout Fishing we see in our area marshes. During the winter months, Specks tend to look for more stable temperatures in deeper water. 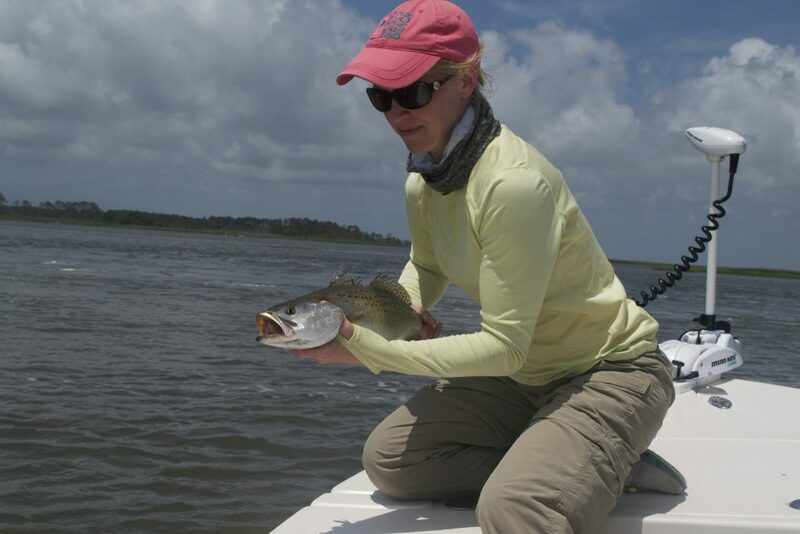 When targeting Sea Trout I fish rips around oyster rakes, creek mouths, mud flats or sand bars. Sea Trout can be caught on the bottom, suspended or feeding on the surface. When trying to locate fish, casting up current and covering the whole water column can be very effective, bouncing the bait off the bottom. The 1/4 oz jig head rigged with soft plastic baits like Z MAN paddle tails work best for this tactic. When fishing over oysters or structure, you can’t go wrong with a trusty popping cork. I rig my (floats) corks with 18-36″ 15 lb fluorocarbon leader and a VUDU or D.O.A shrimp, casting up current and letting the bait sweep along a grass edges. 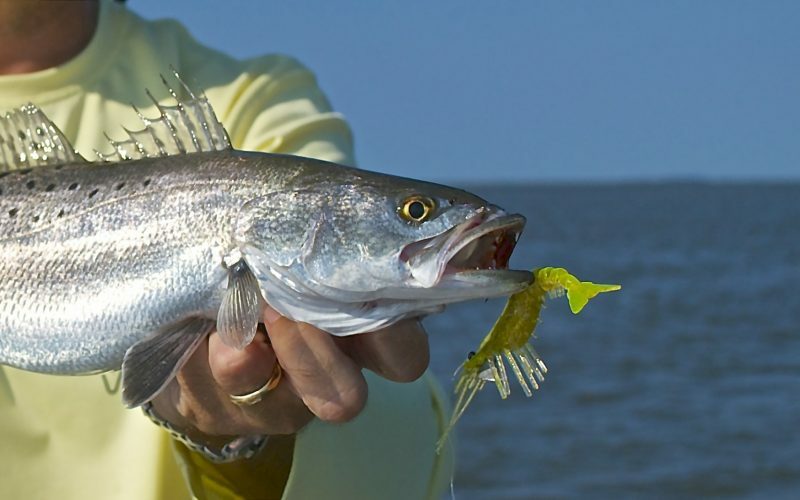 Giving a sharp pop, pop, can be lethal fishing around grass shorelines. Throwing big top water plugs at dusk and dawn is the ticket for big Sea Trout. Big sows are meat eaters. Not to say you can’t catch a big trout on a shrimp, but if you’re after a true trophy, it’s hard to beat large Top Dogs or Zara Spooks. Floating large natural baits like live live shrimp or finger mullets can be a solid tactic for big trout. I strongly encourage anglers to crimp the barbs on their lures with treble hooks for their safety and for the survival of the fish, as well as wetting your hands before coming in contact with their scales. Wetting you hands helps to not remove the fishes protective slim. I hope these few tips will increase your success this season. 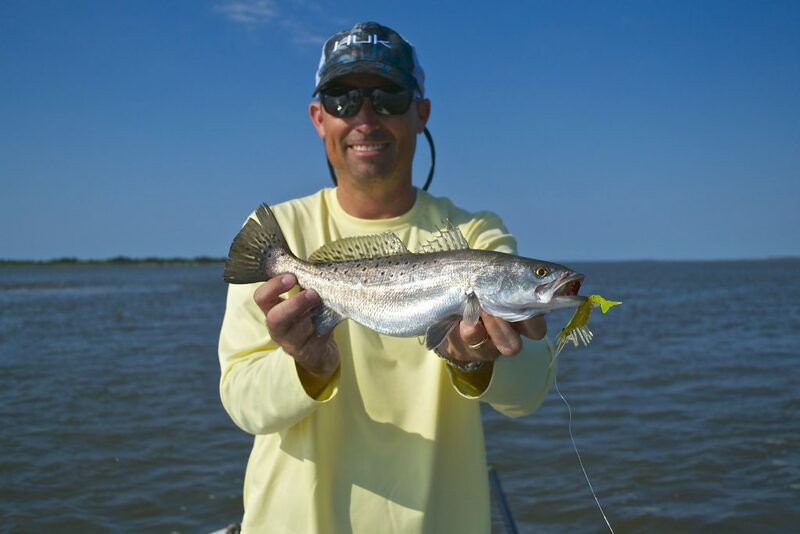 Give me a call to book your Speckled Sea Trout Charter.